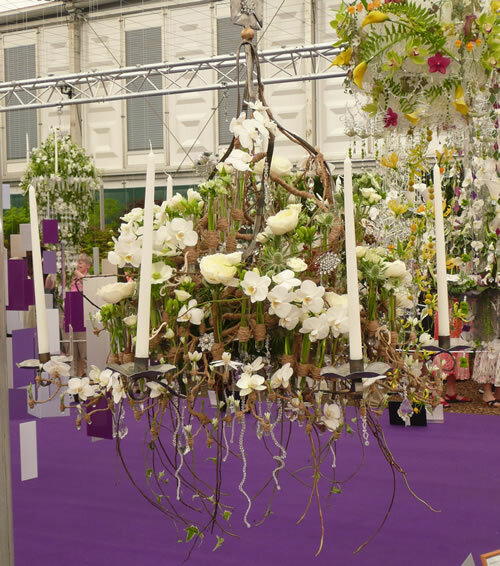 Essex based florists Curtis & Ford have been awarded two medals in the RHS Chelsea Florist of the Year competition 2012. An amazing achievement! they are only business to gain two medals in the same year. The floristry competition attracts hundreds of entrants from around the country and showcases the best in professional floristry. The double success comes after winning international awards in 2011. 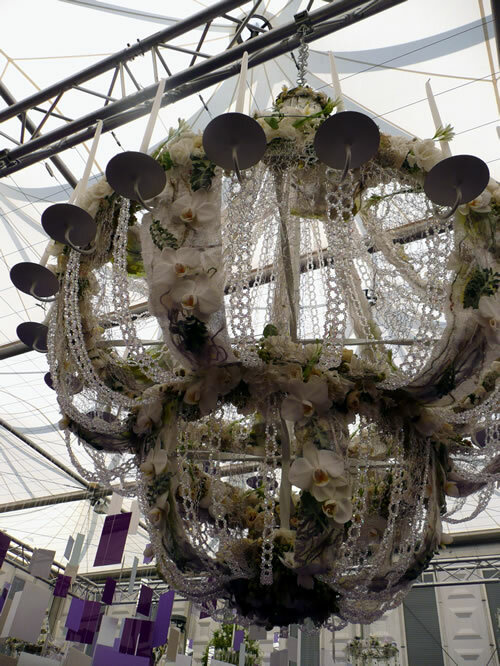 The brief was to design and produce a large Chandelier to be hung at a Jubilee dinner for the Queen. 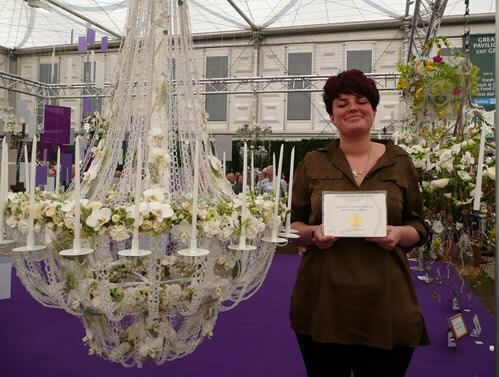 Amy Ford gained a Silver-Gilt medal for her stunning white and lace chandelier design. Amy Curtis was awarded a Bronze medal for her beautiful design that had a very natural and organic feel to it. Amy’s design featured hundreds of branches bound with paper covered wire holding tiny test tubes. 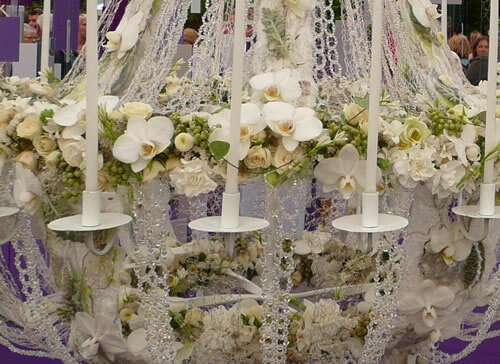 The tubes contained phalaenopsis orchids, freesia, roses, eryngium, anemones and spray roses. It was adorned with beads, crystals drops and diamante brooches. The intricate design took over 350 hours to complete. Amy has completed A Levels in Art & Design, Photography and English Literature. She found floristry at 21 after studying Glass design. Amy has since gone on to complete levels 2, 3 and 4 in floristry. Amy gained the highest practical grade in the country for her Level 4 exam. To prepare for Chelsea piece Amy painstakingly made over 100 panels with fabric, beads and wire. They were sewed, crocheted and beaded; each panel took 2.5 hours to make. On the competition day Amy worked from 4am on Wednesday right up until the final whistle at 12.45am Thursday to finish her design. She used various techniques on her piece, she layered and wove bark and leaves onto the panels and dotted flowers throughout. Amy made 18 beaded panels for each tier using a total of 20,000 beads! Many of the flowers were glued onto the design but some of the more fragile flowers were placed in tiny test tubes. Most of the flowers were arranged in a massed style, Amy used reindeer moss, phalaenopsis orchids, white Lydia spray rose, Romantic Pepita spray rose, tanacetum, triteleia, spray carnations, brunia, cotton bush and hyacinth. Both designs are now on show at Serenity Bridal, 17 St.Botolphs Street, Colchester. Following on from yesterdays post, here are the final 5 of my top ten green flowers. Each viburnum flower head is a cluster of lots of tiny pale green flowers. There are several heads on a stem and each heads delicately bobs about. Their soft green colour looks very natural mixed in any type of arrangement from bouquets to table centres and larger arrangements. Gladioli has made a come back in recent years with lots of gorgeous new colours. 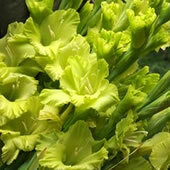 The acid green gladioli look anything but traditional. The flower stems are very long and suit large designs like pedestal arrangements or tall vase designs. 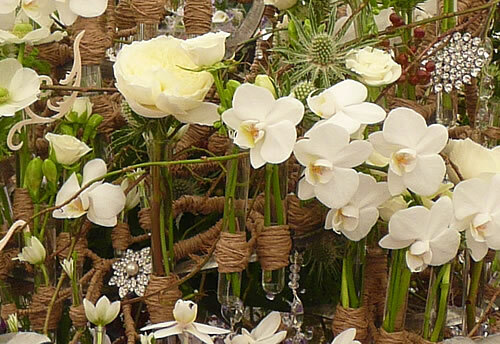 If you want an exotic feel to your wedding flowers you can’t go wrong with orchids. 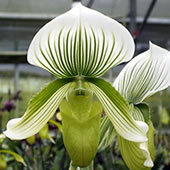 These slipper orchids are exotic and beautiful, mixed in a bouquet with other flowers or peeking above a table design. 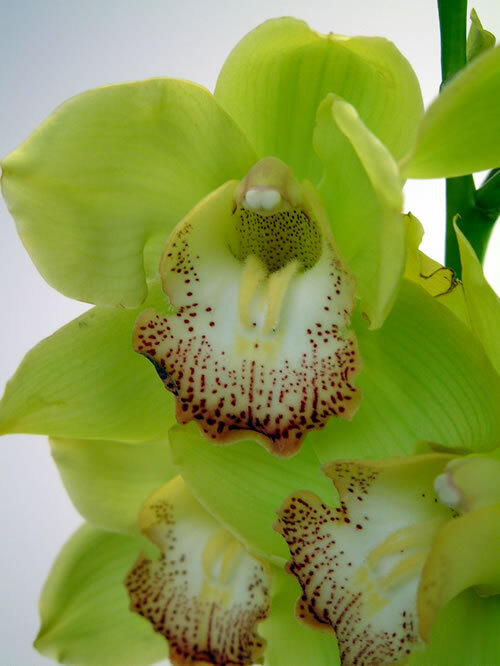 Cymbidium orchids and dendrobium orchids are also available in green. Orchids are one of the dearer flowers but they are striking and very long lasting. Cymbidium orchids are perfect for submerging in tall cylinder vases. 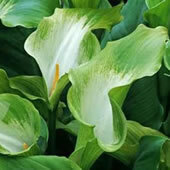 These impressive flowers also known as callas lilies, have huge heads that unravel as they open. They are very tall so are perfect for big vase arrangements or pedestal arrangements. 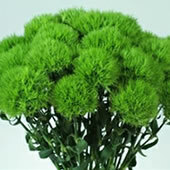 They are a premium flower but they offer a big impact for their price tag and will last several weeks in a vase. Roses had to be number one in the top ten, they are still one of the most popular wedding flowers. This rose is exactly what it’s name suggests, a huge green rose. 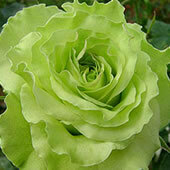 Super Green is a type of rose known as a garden rose or cabbage rose as it has lots of petals and opens up very big. Roses work well in any wedding flowers from bouquets to arrangements. Green flowers may seem like an unusual choice for wedding flowers, but green can be a very beautiful and natural colour scheme. There are plenty of green flowers to choose from whether you prefer soft sage green or bright lime green, you can even get acid green flowers. Adding green flowers to a mixed colour design will ‘lift’ the other colours. 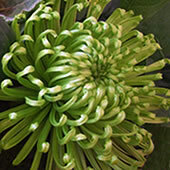 This is a spray type of chrysanth so it has several heads on a stem. The flowers are very hardy so are good for designs that won’t be in water. 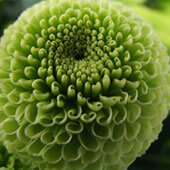 The uniform shape of these chrysanths looks great in compact designs like pomanders or spheres of flowers. These unusual looking flowers are a type of sweet william, from the carnation family. You usually see them in small bunches of pinks and reds. This fluffy flower is a spherical shape and looks a bit like moss. It looks great mixed with a vibrant colour in modern textured bouquets or kept simple with white flowers and foliage. 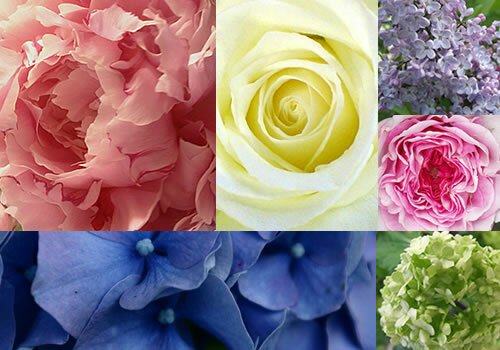 For summer weddings Hydrangea are the perfect flower. 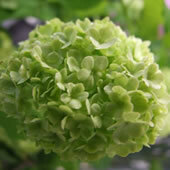 The large blooms come in various shades of green from a soft pale colour to lime to and green with hints of pink. Hydrangeas work well with a country garden theme or a more contemporary look. They are also lovely grouped together for bridal bouquets. Hydrangea may seem a little pricey but they are at least twice the size of most flowers and fill a lot of space in an arrangement. This is the second chrysanth in my top ten list, but it looks so different to chrysanth spray I had to include it. You would be forgiven for not regconising these flowers as Chrysanthemums. Their spiky shape and vivd lime colour is a million miles away from the old fashioned chrysanth sprays supermarkets offer. These blooms work best in large contemporary designs and look fabulous mixed with bright exotic flowers. This flower has beautiful flowing heads that look lovely anywhere flowers can naturally trail or hang down. 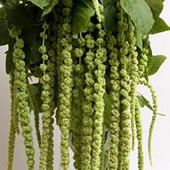 The edge of a mantelpiece arrangement, hanging from a garland at the church entrance or hanging from a bouquet. 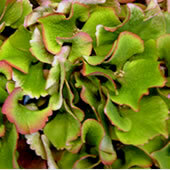 It is a pretty alternative to ivy or grasses. 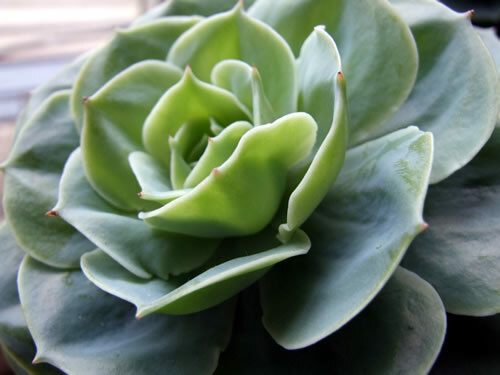 My top 5 green flowers will follow in tomorrows post. 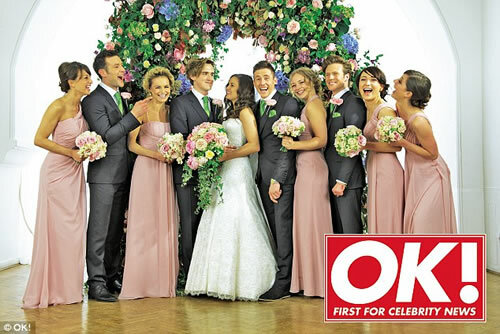 Giovanna Falcone and McFly guitarist Tom Fletcher recently tied the knot at One Marylebone in London. The theme was a romantic, woodland glade; the couple wanted the decorations to give the venue a magical feel. London florist By Appointment Only provided all the flowers for the day, they created designs in a palette of soft pinks, lilac and papery blues with lots of natural looking foliage. The ceremony took place in the Soane hall, the vast space was dressed with lots of floral displays and fairy lights were hung with ivy wound through them. The alter was decorated with a long woodland style arrangement using stocks, lilac, viburnum, roses, hydrangea, spray roses and peonies in pinks blues and creams, with green viburnum and moss. Behind the alter two large pedestal arrangements were placed with summer flowers and delphiniums for added height. The beautiful bride wore an ivory Phillip Lepley gown with a vintage lace overlay and bead detailing. She carried an informal teardrop bouquet of garden roses and peonies in shades of pink and cream, with trailing variegated ivy. Giovanna’s bride’s maids wore full length dusky pink Kelsey Rose dresses. They carried small hand tied bouquets of white sweet peas and roses in shades of pink and cream. The men wore grey suits, with green ties and pink rose buttonholes. The room was transformed for dinner with a combination of low centrepieces and tall canopy arrangements. The low designs featured summer blooms and candles. The tall arrangements rested on twisted willow bases and featured lots of summer flowers and natural foliage. The tables were dressed with paisley cloths in moss green and the napkins were tied with ivy. For favours the guests were given personalised guitar picks that featured the couple’s initials and the date of the wedding. The couple also had a magnificent floral arch that many of the photos were taken in front of. It was packed with summer flowers in soft shades of pink, blue, lilac and cream, with lots of foliage including asparagus fern, photina, ivy and French ruscus. I think the flowers achieved the magical woodland look perfectly, the bouquets and the venue looked truly wonderful. Full photos are in OK! Magazine issue 829, May 29th 2012. 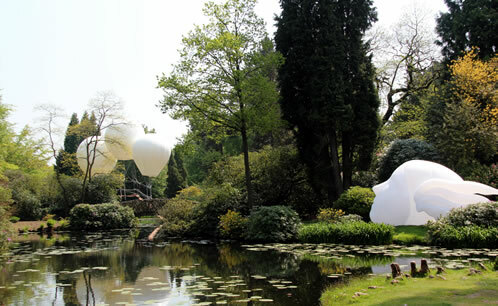 Tatton Park has been holding it’s Biennial contemporary art event since 2008. The event attracts celebrated artists to Cheshire from around the world. The current event explores the human urge to achieve flight and Tatton’s aeronautical history. The grounds of Tatton were used to train parachutists in WWII, and it is now on the flight path of Manchester Airport. The 17 new works feature sculpture, film, installation and performance. The event is set in the grounds of Tatton Park which includes a Georgian Neo-Classical mansion, formal gardens and 2,000 acres of deer park. Visitors will see installations before even parking their car upon arriving at Tatton. Vex by Dinui Lex is a flying saucer, crash-landed in front of Tatton’s mansion. Inside the spaceship video communications from Che Guevara in several parallel universes, tell how he came to crash and his ideas about the merits of space travel and dub music as effective revolutionary forces in todays world. Olivier Grossetête’s installation for the Biennial reflects the follies of the formal gardens and Japanese garden at Tatton. The fragile bridge is unreachable, it starts and ends in the water. It is suspended by three helium filled balloons, reminiscent of man’s first attempts at defying gravity and how flight was once fanciful. Trine Messenger is a seven metre long balloon inspired by Hypnos, the god of sleep and surrealist art. 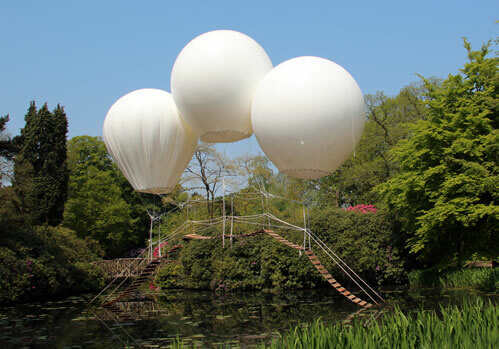 The ethereal balloon has a dream like quality, shaped like a winged head which looks towards another installation further around the island. The design was created using a mean average of the artist’s faces from biomedical facial scans. The data collected was used to produce a pattern for the face which was made in fabric. 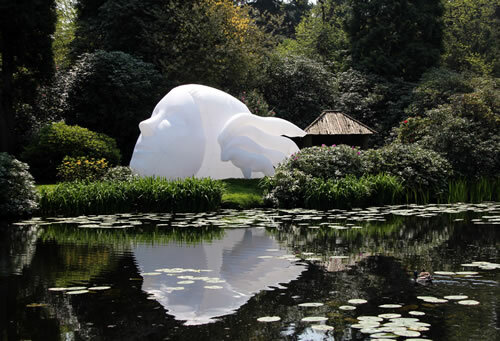 The piece sits in the formal gardens by the tranquil lakes of the Japanese Garden. The works are on display until 30th September in the park, gardens and mansion. As well as Artworks, the Biennial also includes talks by astrophysicists, artist workshops, performances and tours. Other things to see at the moment in the gardens include Davidia involucrata, the handkerchief tree which is flowering now and the rhododendrons and azaleas are also in bloom.